As a Senior Engineer at Integral Powertrain Ltd, Jonathan Peters is used to addressing the toughest challenges and overcoming major hurdles within a team engineering world leading high performance electric motors. Healthy body, healthy mind is personified by Jonathan whose competitive nature, hard work and determination displayed in work has also been present in his spare time, securing a place representing the GB team at the ITU World Duathlon Championships, part of the ITU World Multisport Festival in Penticton, Canada (18th-27th August). Jonathan will take on the tough 55km challenge and will be competing in the 30-34 age group as one of only 4 from Great Britain. Whilst at the World Championships, Jonathan will be promoting the Integral Powertrain brand, as kit sponsors. Back home his colleagues will follow his progress at the event, wishing him every success. Jonathan has been a keen runner for around 5 years now, and occasionally dipped into road cycling every now and then during that time. Following a string of running injuries during 2015 and 2016, he decided to change focus and reduce his running distance while increasing cycling, hopefully with the target of getting injured less! It has been a fairly tough transition and has resulted in a lot of hard work for Jonathan, as he tended to fare better in running races than cycling. Now the hard work has paid off. Most would agree that Triathlon is likely to remain the favoured multisport event of the masses, and Jonathan is keen on reaching a competent level in the water, so maybe this is something he will work towards in the future. For now, running and cycling are what he enjoys doing the most. In order to qualify to represent GB, he needed to be one of the top 4 finishers in his age group and within 115% of the winner’s time at one of 3 available qualification events. He achieved this on his first and only standard distance attempt this year at the last available event which was the Stockton Duathlon Festival in April. In retrospect it would have been better to do more than one qualification event but it does not hurt to get it right first time. Jonathan had only competed in two standard distance events before and more experience, though not needed would have been beneficial. The training for qualification started in spring 2016, however Jonathan lost a good part of the year recovering from a stress fracture in his left leg. This, fortuitously gave him the ‘opportunity’ to focus more on cycling, with getting back to running and qualifying in the autumn for the European championships in spring 2017 as his goal. Alas the stress fracture took longer to heal than expected, forcing him to wait until the winter to start training and to reset his target to the World 2017/Euros 2018. Winter was a bleak time for Jonathan, with most of his bike training taking place on a turbo trainer in his shed, but at least he was able to build up some running mileage again. As spring blossomed, the running was progressing well (The Integral Powertrain spring running challenge helping there) and he re-familiarised himself with multisport racing at a sprint distance Duathlon at Bedford. Jonathan built up the training volume for this event with lots of cycling. It went well though he would still benefit from more time on the bike. The summer brought more isolated attention to each discipline, racing where possible in 5 and 10k running races and local club cycling time trials. The hard work certainly started to pay off gaining some PB’s on the bike and he also managed a new 10k run PB too. “I am really looking forward to Canada now. Over the final training period I will be working more on ‘Brick’ sessions, simulating transitioning rapidly from run to bike and back, and all of the associated transition chaos of changing shoes etc. where an alarming amount of time can be lost!” says Jonathan. 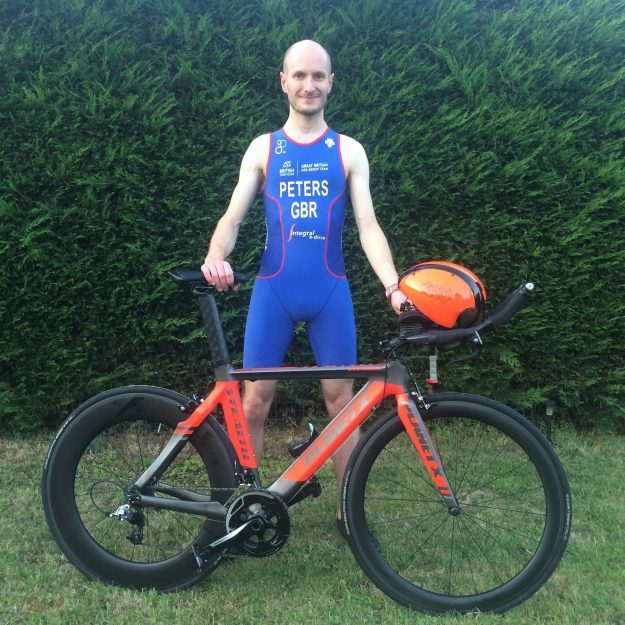 The ITU World Duathlon Championships will be a great experience for Jonathan. As one of only four GB members competing in the 30-34 age category he’ll be aiming to replicate the world class performance he’s part of in his working life within his sporting activities. Go Jonathan, go GB Team.